Entrepreneurialism is an important component of job growth in rural Wisconsin, such as communities like Neillsville in Clark County. A deep divide between residents of rural and urban communities around the United States has become a common point of discussion following the 2016 presidential election. Comparisons between rural and urban America often paint urban areas as wealthier, younger, more educated and, perhaps most noteworthy to the next election cycle, more progressive in their politics. Conversely, rural America is often characterized by higher poverty rates, an older population, as well as traditional values and work ethic. Residents of rural areas are more likely to own a home and to have served in the military, but rural areas are also struggling with relatively high suicide rates, opioid abuse, and slow job growth. However, urban settings are not the same everywhere, nor are their rural counterparts. In Virginia, rural-urban differences contrast historically coal-dependent counties with the white-collar suburbs of Washington, D.C. In Texas, the international trade, oil and cheap labor-dependent Harris County, home to Houston, is surrounded by rural and often isolated farming and ranching communities on the prairie. Similarly, in Wisconsin there are unique differences between the urban communities of Milwaukee and Madison, with their legacy-industry manufacturing and government-education tandem, respectively, compared to agriculture-, manufacturing- and tourism-intensive rural counties. Vast differences across the U.S., such as low population density in the Great Plains and the ongoing growth in retirement destinations in warmer southern states, make national-level comparisons only somewhat useful for understanding local and regional issues that characterize rural and urban Wisconsin. Focusing on the state alone and taking a slightly deeper dive into its regional issues lends insight into some key differences between urban and rural areas. 1. Most new jobs are in urban Wisconsin. Wisconsin's recovery from the Great Recession has been scrutinized across a number of social and economic measures. Measures of the recovery in the state have been led by job growth in urban communities. 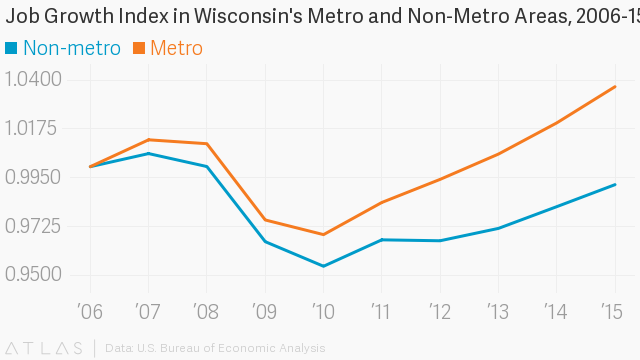 The strong economic performance of Wisconsin's cities has offset and obscured the more sluggish recovery in rural parts of the state. Although the state's unemployment rate fell to a low 3.1 percent in May 2017, this figure hides the fact that rural counties lost a larger share of jobs and have been slower to reach pre-recession employment levels. While rural and urban are commonly used terms, they are also defined as non-metropolitan and metropolitan counties, respectively. The gap in job growth may partly reflect the demographic differences in rural and urban counties. The population in rural counties is generally older and thus more inclined to exit the labor force entirely by retiring early when work is unavailable. In fact, labor force participation rates in rural America are lower than in urban areas and facing further declines. Additionally, limited job opportunities in rural areas may be driving migration into cities. Young people in particular are more likely to pursue opportunities in urban areas, contributing to the aging demographic of rural communities. 2. Rural Wisconsin is entrepreneurial. Employment growth in the U.S. and Wisconsin has been largely spurred by entrepreneurs. Since 2000, an average of nearly 9,900 businesses that have employees have started each year in Wisconsin. While startup activity may conjure images of bustling metropolitan downtown districts, rural counties outperform urban areas across several measures of entrepreneurship. Wisconsin's rural communities are often home to innovative self-employment activity. Indeed, in many ways, farmers have one of the most entrepreneurial occupations. Agricultural enterprises have a predominantly owner-operator structure, which combined with the self-sufficiency of rural self-employment and a dearth of wage-and-salary opportunities, makes rural Wisconsin especially entrepreneurial. Proprietorships are actually more common in Wisconsin's rural counties than in their urban counterparts. Additionally, rural businesses are more likely to reach a critical five-year mark in their lifespan, despite the rural disadvantages of smaller markets, fewer suppliers and limited labor pools. 3. Rural Wisconsin depends more on goods production and the public sector. The differences between rural and urban economies are partly the result of differences in industrial composition. Rural places are generally associated with agriculture, a sector that provides a much larger source of earnings in rural settings than in cities or suburbs. However, agriculture still accounts for just 5 percent of rural earnings. Rural Wisconsin is far more dependent on the production of goods, as evidenced by the combined income from agriculture, mining and manufacturing in these counties. Consequently, the global economic forces and technological advances that resulted in changes to manufacturing have disproportionately affected rural areas and will likely continue to cause disruption. Employment losses in manufacturing, for example, may be a key component of the slow rural jobs recovery. The relatively large role of the public sector also means that cuts to government spending can put pressure on major rural employers like public schools, post offices, police services and transportation departments. Indeed, as the local public school system is the largest employer in many rural areas, changes in fiscal policies at the state level may disproportionately impact the economies of rural communities. 4. Urban Wisconsin is less likely to be "under-educated." Often the discussion of a skills gap emphasizes workers, workforce readiness, and other employee-focused initiatives. Yet understanding the skills gap requires thinking about the skills of the workforce as well as how they meet (or do not meet) the needs of employers. Comparing the education level required by employers, based on their industry and job offerings, to the education level of the workforce can reveal the extent to which these mismatches of "gaps" may be occurring. A skills gap may be indicative of workers being relatively underskilled compared to what employers require. However, a skills gap may also occur when workers are relatively overskilled compared to the needs of employers. The expected level of education is the share of the jobs that require a bachelor's degree or higher based on the industrial composition and occupational requirements of jobs available in a particular county. This measure is estimated based on industry and occupational data available from federal agencies for 2012. The actual level of education attainment is the share of the county population that has a bachelor's degree or higher from the U.S. Census American Community Survey 2010-14 estimates. Based on these metrics, a county is more likely suffering a skills gap if the actual education of the population is above or below that which its industries require. Counties where the actual level of education attainment is below the expected level of education are considered "under educated" and may face a skills gap. Conversely, counties where the actual level of education attainment exceeds the expected level are considered "over-educated." In Wisconsin, most "over-educated" counties coincide with urban areas, which could be a key driver of high growth in these places. Conversely, nearly all "under-educated" counties are rural, suggesting the skill requirements of the industries and occupations outside of urban centers exceeds those of the residents of those areas. This type of skills gap can lead to unfilled jobs and hinder economic growth. 5. The most rural and urban Wisconsin counties are similarly more diverse. There are several ways to think about and measure diversity by focusing on immigrant and minority populations. Far from the coasts and southern borders, Wisconsin has relatively small shares of these populations. Diversity can also be measured by comparing in-migration from within the United States, but even then Wisconsin ranks below the national average in attracting people from other states. Wisconsin's population consists mostly of people who were born in the state. In fact, over 70 percent of the people living in Wisconsin were also born here, more than the national average of around 58 percent of people living in the state of their birth. The share of residents in each county who were born in Wisconsin, however, does vary across the urban-rural continuum, and the most urban and most rural counties both have relatively low shares of Wisconsin-born residents. Meanwhile, in the middle of the spectrum, smaller cities and larger towns have above average shares of Wisconsin-born residents. The relatively small shares of Wisconsin-born residents in the most urban and rural settings likely arise for very different reasons. While urban areas tend to disproportionately attract relatively young workers from out of state, the most rural areas in Wisconsin are likely attractive to retirees from other states who are moving to their onetime vacation homes. While both types of areas have smaller shares of residents who were born in the state, the socio-demographic makeup and economic implications are very different. Urban areas are more likely to attract relatively high-skill opportunity-seekers from out-of-state whereas the most rural areas benefit from an experienced population with deeper financial resources that has been tied to higher entrepreneurial activity. Thus, even in a context where rural and urban counties look similar based on simple statistics, the story behind these numbers suggests very different rural and urban scenarios. The rural and urban comparison in Wisconsin is useful for informing local economic development initiatives. Rural Wisconsin has experienced a slower rate of employment growth than more urban areas in the recovery from the Great Recession. When looking for sources of job growth, it may be tempting to focus on those industries like manufacturing that currently provide large portions of rural income. Yet, manufacturing is declining nationally, and and recruiting firms to rural areas may be difficult given that very few ever move. Instead, job growth may be more effectively pursued through supporting entrepreneurs who have proven a critical component of job growth. Given that rural Wisconsin seems to already have the seeds of entrepreneurship in the form of proprietorships and high business survival, this may be an especially promising strategy. Moreover, parts of rural Wisconsin have natural amenities that can attract skilled populations. In rural high-amenity areas, where good jobs may be scarce, these skilled residents are a pool of potential entrepreneurs. Their best option may be to create employment for themselves. Among these skilled populations are often retirees who, with the benefit of having accumulated experience and financial capital, have significant entrepreneurial potential. Taken together and combined with what is known about national trends, these patterns in Wisconsin point to a potential strategy for rural development that focuses on investing in entrepreneurs as a local asset. Tessa Conroy is an economic development specialist at the University of Wisconsin-Extension Center for Community and Economic Development and an assistant professor in the UW-Madison Department of Applied & Agricultural Economics.